An Air Canada plane sits on the tarmac at Pearson International Airport in Mississauga, Ont., on Wednesday, Jan. 2, 2019. 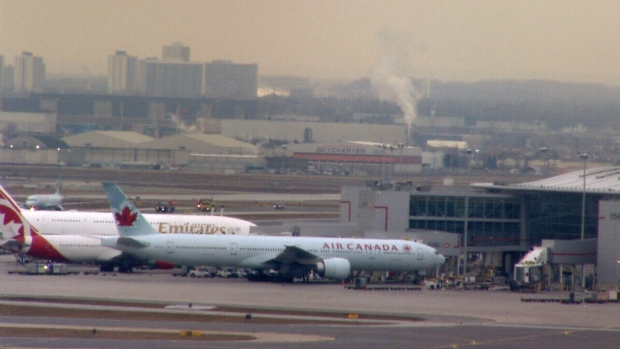 An Air Canada flight returned to Pearson International Airport shortly after taking off Wednesday morning. The flight took off from the Mississauga, Ont., airport shortly after 10:30 a.m., bound for Winnipeg, but returned less than 15 minutes later after the smell of burning plastic was noticed at the back of the aircraft. The plane was able to land safely at Pearson. An Air Canada spokesperson said the 124 passengers would board a different plane and take off Wednesday afternoon.